Home > 20 Sep 2018 – New Listings in Berkeley Albany Kensington El Cerrito & Oakland! 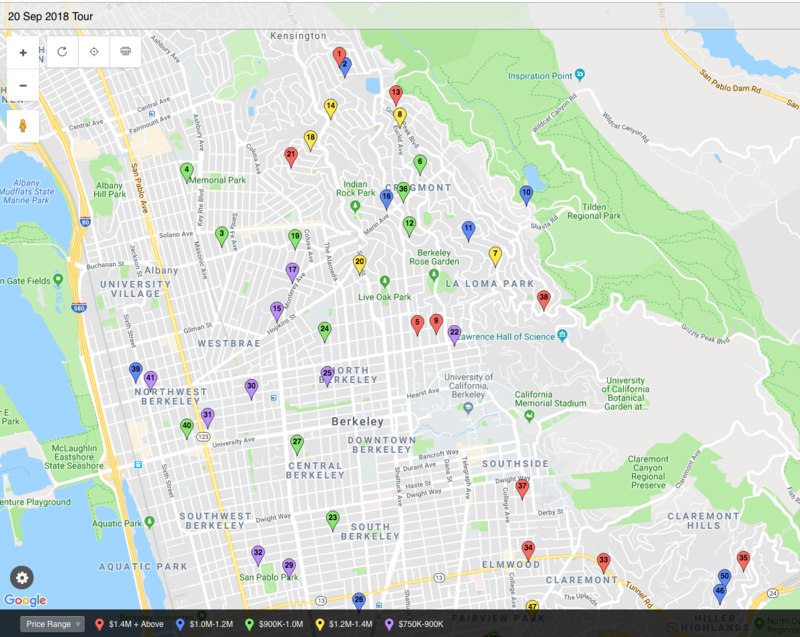 20 Sep 2018 – New Listings in Berkeley Albany Kensington El Cerrito & Oakland! Click to open the interactive map – Call Ira & Carol Serkes at 510-684-3334 to let us know which home(s) interest you! Seller Agent Comments: Fresh Coastal appeal-One of a kind exquisite home with panoramic Bay views. Deep lovely terraced garden and a separate work/artist studio. Gorgeous expansive kitchen with custom cabinets, stone counters and an ideal layout for entertaining. Beautifully appointed throughout with an elegant yet livable design. Enjoy sophisticated living blocks to award winning Hilltop Elementary School, shops, Trans-Bay, BART and direct bus. Sellers’ Representative: RUTH J FRASSETTO THE GRUBB CO. INC. Seller Agent Comments: Wonderful light filled, updated home on quiet cul-de-sac in prime Upper Kensington. Gorgeous kitchen, tasteful baths and rich hardwood floors through out. Inviting tiered garden with lawn and entertaining area. San Francisco Bay and Golden Gate views. Close to Kensington Village, award winning Hilltop Elementary School and Tilden Regional Park. Blocks to Trans-Bay and BART direct bus stop. Seller Agent Comments: Charming Albany MacGregor! Sunny 3BR/3BA plus bonus room w/many upgrades including new & refinished H/W floors, new paint inside and out, new ceiling insulation on both levels, EQ retrofit, including soft second story support and foundation upgrades engineered by Dan Szumski and work done by Dave Ford Construction, beautiful landscaping front and back w/ drip irrigation system, new deck and stone patio. ATT fiber network installed for state of the art internet access. Sewer Lateral Certificate and Pest report work done, newer roof. Located in central Albany w/close proximity to top-rated schools, Memorial Park, E.C.plaza & BART. Solano Ave. shops, restaurants, coffee and more are minutes away! Seller Agent Comments: Handsome, rare 1924 original Golden duplex in top Gourmet Ghetto locate. Upper and lower units. Both feature lovely crown molding, fireplace tile, oak floors with a terrific layout. Some kitchen and bath updating in lower unit. Some updating in upper bath unit. Both have a good sized room off the kitchen for use as an office, den, child room, etc. Each unit has it’s own washer/dryer. Beautifully landscaped front and back yards with drought tolerant plants and a drip system. Sweet DG patio in the back. The lower unit has a large basement area accessed by an interior stair. Detached carport at rear of lot. Close to many amenities: UCB, Cheeseboard, Thurs. Farmers market, downtown Berkeley and BART and commute buses. Bicycle Blvds nearby as are many parks: Cordonices, Rose Garden, Live Oak. A rare opportunity for a very special property. Seller Agent Comments: Opening to a dramatic living room in the spirit of Maybeck, this home offers beauty and an easy lifestyle. Great, wide windows in the living room and sunny family room look out to San Francisco, the Golden Gate bridge and Bay views. Extensive redwood paneling deepens the natural feel of the home. Built in 1927, this has been home for the same family since 1967. Their care has maintained the classic charm and architectural details while making improvements over time. Dining is a pleasure indoors and out ‚Äì choose the dining room with views of tree tops and the lush lawn or open the double doors to bring the party outside for a great meal on the deck. Garden steps lead to a park-like redwood setting along the lower paths. Enjoy the bright kitchen overlooking the garden‚Äôs lovely rhododendrons and azaleas and don‚Äôt miss the secluded front patio among the trees. The ground level is a bonus with the laundry room, storage and two additional rooms you can adapt for your favorite activities. Seller Agent Comments: Welcome to 1238 Campus Drive ‚Äî a light and open 4 bed, 2 bath Mid-Century home with generous space, lush gardens, modern touches, and an ideal location. The intuitive layout offers 2 bedrooms and a full bath upstairs and another 2 bedrooms and full bath downstairs. The living room and master bedroom each have a fireplace, with multiple access points to the home‚Äôs many private outdoor spaces. The main floor has an open plan kitchen/dining/living room with near floor to ceiling windows on all sides. The deck overlooking the garden is an entertainer‚Äôs dream and the huge bonus room could be used as a family room, guest quarters, office, or art studio. The outside of the home also has new solar panels, newly painted exterior, new partial fence, and recently enhanced landscaping. Conveniently located near five Berkeley parks, AC transit bus stop, as well as minutes to BART and Gourmet Ghetto’s shops & restaurants. Open House 9/22 & 9/23 from 2-4:30PM. Seller Agent Comments: Gorgeous Tudor-style home with easy, indoor-outdoor living on a 13,000+sf lot, ideal for entertaining friends. Views of SF, Mt. Tam and the bay from many rooms in the house including the spectacular living room with ultra high ceilings and exposed wooden beams. Step out of the kitchen, through the sun-drenched sun room, to enjoy your coffee on the hillside while soaking up the view and your spectacular garden with room for fruit trees and more. Circular flow, between the entry-level floor and the level-out patio great for ping-pong, Zen garden and yard, makes the house feel warm and inviting. Original fixtures and leaded stained glass windows add to the charm of this magical property. The 65 bus is nearby and takes you to points through the Gourmet Ghetto, downtown Berkeley and campus. Proximity to Tilden Park hikes, The Little Farm, Lake Anza and more make this location a winner! Seller Agent Comments: This lovely, updated, mid-century home offers one level living with large walls of windows to take full advantage of the natural light & views. Situated above the street gives a wonderful sense of privacy and being one with nature. Inviting in/out flow to the yard with serene outlooks to the park and gardens. Upon entering you are treated to a lovely slate entry and big open views. The floor plan is both open and cozy with brick and wood accent walls, soaring ceiling, and a delightful curved fireplace. The updated eat-in kitchen with yard access is ideal for entertaining or watching who‚Äôs playing in the yard. Large private lot with level grassy area and patio, plenty of room for outdoor entertaining, fun and games! Large 2-car garage and big basement/utility room is ideal for a game room or hobbies. Located in the desirable Park Hills neighborhood of the Berkeley Hills, with the utilities underground, a community play field and Tilden Park is almost next door. Seller Agent Comments: Breathtaking Bay View Midcentury. Modern kitchen, open floor plan, quality updates throughout. View from most rooms, balcony off LR/DR, deck off family room, & even from roof w/EZ access from carport (think potential roof deck?!) 3+br/2 stunning new baths. Lower level w/kitchenette & separate entrance for au pair or potential income unit. Expansive lot w/level play yard. Perfect home for family gatherings and EZ indoor/outdoor entertaining. Near Tilden Park & Golf, transit, numerous pocket parks and foot paths. Seller Agent Comments: Light-filled mid-century home with open floor plan and wide views of the bay and Golden Gate Bridge. Wonderful separation of spaces and great indoor/outdoor access. 3+ BR, 2 BA includes Master BR retreat with huge walk-in closet. Expansive living with beamed ceilings and clerestory windows, updated kitchen, hardwood and parquet floors, Malm-style conical fireplace in LR, and plus room for office/study. Site features stone terraced gardens with sunny decks and patio, Coast Live Oak, Bay Laurel, Walnut and adjacent Redwoods, and 2 car off street parking. Close to schools and parks, with easy access between Spruce and Euclid. Open Houses 9/20 from 9:30-12, and 9/23 from 2-4:30. Seller Agent Comments: Elegant 1920’s vintage Arts and Crafts home with separate and private cottage on back of spacious woodsy lot. Favorite Woodmont location walking distance to Tilden park amenities and easy access to Cal and LBL. Great period details and indoor/outdoor access. 3 bedrooms, 2 baths in main house, den with Juliet window, hardwood floors, formal dining room. May be the earliest built home on the block. Walking distance to bus line. Just up the hill from popular Shattuck and Soloano Ave shopping. Convenient to downtown and north Berkeley Bart stations. Seller Agent Comments: Handsome English architecture designed by noted architect John White c. 1870-1941 (brother in law to Bernard Maybeck) sited on a remarkable park like parcel on a third of an acre with gorgeous natural landscaping and picturesque stream – Simply magical! An architectural Gem with rich wood finishes, grand fireplace and inviting livable floor plan. Separate workshop/studio above garage. This fine home is located in a coveted location near Kensington Village, Solano Ave, parks, Chez Panisse and transportation. Central to everything Berkeley! Seller Agent Comments: Light and bright condo in a perfect location! Second floor unit with 2 bedrooms, 1 updated bath, refinished hardwood floors, good-sized bedrooms, dining area and an updated kitchen with a farmhouse sink, lots of storage and a cork floor. Also included is a bonus space on the ground floor, perfect for a home office, studio, guest or au pair quarters, with a second full bath and a separate entrance. Monterey Market, Cafe Roma, Berkeley Horticulture and a host of other gourmet Northbrae shops are steps away. Super convenient to N. Berkeley BART, buses and freeway too. Seller Agent Comments: This jewel-box like home holds a treasure trove of delights awaiting your discovery. Built circa 1915, it embodies Berkeley‚Äôs early Arts and Crafts movement, with an elegantly symmetrical edifice clad in natural wood shingles, and an outdoor art gallery front walk. Once inside, authentic vintage details abound, combined with thoughtful upgrades and hand-crafted enhancements. Every room offers something intriguing and unique, while the San Francisco Bay sparkles beyond. The entire upper level of this home is given over to a giant, luminous master suite comprised of several flowing, flexible spaces. A glass-enclosed sunroom with stunning views could be your yoga studio. An intimate alcove under a skylight makes a dreamy reading nook. A spacious main room, complete with micro-kitchen, suggests an in-law arrangement. Two massive walk-in closets are big enough for home office or nursery, and a wide, light-drenched front room could be another bedroom, play area, or music/media room. Seller Agent Comments: This one oozes charm and arches and location location location, smack in the middle of the coveted Monterey Market neighborhood. Convenient split-level floor plan with fireplace, dramatic high-beamed ceiling in the living room, formal dining with a wall of windows, built-in bookcases and china hutch, separate breakfast room or office, attached garage/workshop and unparallelled convenience. BART, freeway access, shops, restaurants, libraries and swell neighbors. We believe just two families have owned this little jewel of a house since it was built in 1928. Sellers’ Representative: COLLEEN LARKIN THORNWALL PROPERTIES INC. Seller Agent Comments: Situated low in the hills of North Berkeley on a quiet, tree-lined street above The Alameda and below The Arlington, this elegant three-bedroom, two-bathroom 1925 Tudor has great bones and is brimming with Old World character and charm. Beautiful wood floors, doors, and crown molding coupled with ample natural light, create a living space that is both warm and inviting. The split-level floor plan flows seamlessly from common areas to private spaces. The mostly level lot leads into the colorful, serene backyard, which is perfect for entertaining, gardening, or simply enjoying your morning coffee. There is potential to add a second master suite in the walk-up, oversized attic. The breakfast room could double as an office, or add your own hideaway off of the garage. This home is waiting to be transformed into your dream home! Located between two thriving areas: SOLANO Avenue’s shopping and restaurants, and KENSINGTON CIRCLE’s pub, bakery, shops and Sunday Farmers’ Market. Seller Agent Comments: Lovely and spacious craftsman-style home in a great North Berkeley neighborhood, just blocks from Solano Ave. The home features 3+ bedrooms, 2 baths, a formal dining room, recently refinished hardwood floors, and a 2 car attached garage. The expansive living room has built in cabinets, a fireplace and lots of natural light from its many windows. The dining room offers beautiful wainscotting, a large built in china cabinet, a stone-faced fireplace and a beautiful boxed beam ceiling. Being sold for the first time in 50 years, this home does need some remodeling/work but offers wonderful charm and potential! Seller Agent Comments: Gorgeous traditional home in North Berkeley, Northbrae area, close to Gourmet Ghetto restaurants and shopping. Built ins in dining room feature original stained glass cabinets and coffered ceilings. Dramatic foyer leads to a formal living room with coffered ceiling and period fireplace & adjacent Family room. There are 3 plus rooms that could be used for an office, sunroom or other uses. Golden Gate, Bay and City views from upstairs. Recently refinished roof and upgraded electrical. Refinished hardwood and Douglas fir floors, newer interior paint and light fixtures. Newly landscaped front and back yards with automatic drip system. Seller Agent Comments: Move right in and enjoy an easy lifestyle in one of the best North Berkeley neighborhoods! Great floor plan, sunny, fenced yard, 2-car garage, sophisticated style and extensive updating! A rare opportunity. Close to parks, schools and shops. Sellers’ Representative: BEBE C MCRAE THE GRUBB CO. INC. Seller Agent Comments: Spacious and lovely! Light-filled condo close to all amenities. Great indoor/outdoor living! Huge front terrace with partial views! 2+BR includes family room. This condo is a rare offering with unusually large living room with fireplace and built-ins. Only 5 Units in building. Sellers’ Representative: SUSIE SCHEVILL THE GRUBB CO. INC. Seller Agent Comments: Significantly updated North Berkeley Bungalow has an ultra-modern Dwell-like aesthetic, high-end finishes + a state-of-the art kitchen/bath! Sophisticated, sleek designer touches throughout! Corner location characterized by an open floor plan, two outdoor seating areas for wonderful indoor/outdoor flow and well-appointed above the street for maximum privacy. Surrounded by serene meadow garden of shimmering grasses + bamboo by renowned landscape designer John Greenlee. Meticulously maintained with newer systems and roof, structural updates and recycled eco insulation throughout. Ideally located on a tree-lined street in a great neighborhood close to Monterey Market, Solano Ave. + the Gourmet Ghetto, North Berkeley’s public library, tennis courts, pool and track at MLK Jr. High or the edible garden. For a civilized commute, BART, casual carpool, FS and H Trans-Bay buses are close by. Amazing hiking trails + bike paths await in nearby Tilden Park. Sellers’ Representative: COLETTE FORD THE GRUBB CO. INC. Seller Agent Comments: Private oasis in the ideal North Berkeley location, magical garden welcomes you to this brown shingle 2+ bed/ 2 bath detached condo cottage. Kitchen with abundant storage and prep space opens to dining/living room with skylights, vaulted wood paneled ceilings, bay window with seating bench and verdant views from every window. Plus room for office/guest room and full guest bath. Handcrafted brick pathways meander through a glorious garden and outdoor seating area. Truly a special, well-maintained offering. Upgrades: kitchen renovation, radiant heating, tankless water heater, sewer compliant & more. Blocks to North Berkeley BART, shops, bicycle boulevards, parks. Seller Agent Comments: Opportunity knocks! Available for the first time in 20 years, this tri-plex is neatly tucked-in on a tree-lined, stroll inspiring block of Prince Street. A commuter’s dream to any point in The Bay Area. Easy access to freeways, Transbay buses, carpool, & just two blocks to Ashby BART. The perfect location if you enjoy shopping at Berkeley Bowl or Whole Foods, Downtown Berkeley, UC, The Elmwood District, and so much more. If lifestyle is what you seek, this could be your best bet. Seller Agent Comments: Lovingly designed and created, this recently renovated 2 bed/1 bath home is one of Berkeley’s most desired neighborhoods. Features include an open concept living/kitchen/dining room, heated faux-wood tile floors, solar power, and a beautiful gas fireplace! The kitchen will be a delight to cook in – stainless steel appliances, built-in microwave and oven, and ample storage – any chef will be inspired. New tile flooring, dual pane Marvin aluminum clad windows, security camera system by Hikvision, and more! OPEN SAT 9/22 AND SUN 9/23, 1-4. Sellers’ Representative: Mickey Huey MB Realty & Investment Co. Seller Agent Comments: Lovely 2BR/1BA Craftsman Bungalow! One-level living, light & airy, original Craftsman details, LR with gas fireplace and hardwood floors, DR with exceptional light, updated kitchen with Ruvati SS sink, Bosch DW and LG stove, gorgeous remodeled BA with heated floors, tub and shower stall, one bedroom has sliding glass doors to tranquil enclosed sun-porch with screened doors and windows overlooking back garden sanctuary, plus a large, separate workshop/storage structure with skylight. Two blocks to SF Express bus, 9 blocks to Ashby BART, 8 blocks to Berkeley Bowl West Groceries, 6 blocks to Homemade Cafe & Breads of India, close to San Pablo Park and easy access to freeways. Sellers’ Representative: JUDITH C RATCLIFFE THE GRUBB CO. INC. Seller Agent Comments: Beautifully renovated 2 bedrooms, 1 bath home. All renovation work done includes but not limited to new exterior and interior paint, dual pane windows, hardwood and tile flooring throughout the home and bathroom. New kitchen and bathroom with exquisite counters, cabinets and tiles. Quality fixtures and appliances throughout. Brand new furnace and tankless hot water system. A new wooden deck to enjoy those relaxing days and Barbeques Located in highly desirable neighborhood and 1.5 block from North Berkeley BART station. Easy access to all conveniences and Highway 80. A must see to truly appreciate. Seller Agent Comments: Stunning Victorian home was lifted and modernized and is now the top floor condo in a 3 unit community. Huge bonus spaces define the property: aprx. 698 sq ft attic* has two plus rooms, an additional office is on the main level, and an exclusive deck leads to a shared yard. Rich with beautifully crafted, original details including: two fireplaces, high coved ceilings, wainscoting, picture rails, window seat, and leaded glass built-ins. Exquisitely remodeled, open plan kitchen has a large adjoining family room or eat-in area. Featuring walk/bike ‚Äúparadise scores, it is just blocks to 4th street, North Berkeley BART, Amtrak station, and international food scene along San Pablo Avenue. Coffee shops, bakers and bars abound in this fun location offering the best of Berkeley. *Aprx. sq ft of attic per previous owners sketch, not included on public records. Neither seller or listing agent has verified the accuracy of any of these sources of information. Seller Agent Comments: A Happy Home! Light, bright, classic bungalow in vibrant San Pablo Park neighborhood. Original charm including hardwood floors, fireplace and picture rails, yet with many updates including an open kitchen that leads to a large, sunny deck for al fresco dining and play, renovated bathroom, high efficiency furnace and on-demand water heater. Super cute studio with bathroom and kitchenette, sunny backyard and beautiful drought tolerant landscaping with views of the Berkeley Hills. The spacious popular park, right outside, offers tennis, basketball, baseball, soccer, two playgrounds, a community center and picnic spots. Blocks to Berkeley Bowl West, restaurants, shops and TransBay express bus to SF. Biker’s Paradise Bike Score of 99, close to BART and easy access to freeways. Sewer compliant and earthquake retrofitted. Move-in ready! Open Sundays 9/23 & 9/30, 2-4:30. Seller Agent Comments: Romantic & magical modern home, originally built 1947 & re-imagined in a spectacular way. Floor to ceiling windows & views of San Francisco & The Bay create a dazzling constantly changing vista while the enchanting tropical garden is accessible from most rooms on the main level, opening in a courtyard fashion. Sleek white walls & Saltillo tile floors lend a Southwest feel to the home. The spaces are light-filled & open as well as dramatic but in a serene way. The large eat-in kitchen shares a fireplace with the spacious fam rm, large enough for seating & pool table! Two plus BR’s, two & 1/2 BA, & an office or BR complete the main level. Entry level has two BD’s & BA, perfect for office/sitting room or perhaps for extended family quarters. A 1 person elevator from garage to main level makes living here easy. Located on a coveted European feeling cul-de-sac near coffee, hiking trails, pool & tennis clubs. Trans-bay, BART & easy freeway access. A true vacation home, a world onto itself! Sellers’ Representative: FAYE KEOGH THE GRUBB CO. INC. Seller Agent Comments: This timeless traditional enchants everyone who encounters it. Over the past year, the property has undergone an extensive renovation and care has been taken to maintain, and enhance, the intrinsic charm that was originally designed in 1922. Cathedral windows in the living room are reminiscent of a duomo and the expansive kitchen great room opens to surprising and spacious gardens. Only 5 steps to entry take you into the home where all of the living space is on a single level. Designer materials have been used throughout. Beyond the many sought after features of the home, is the location. This block of Piedmont Avenue is arguably one of the most desirable locations in all of the East Bay. The wide tree line street is just a block from College avenue and Equidistance from UC Berkeley, The Rockridge shopping district and the Claremont resort and tennis club, this location simply can not be beat. Seller Agent Comments: Just blocks to UC Berkeley and College Avenue shops and restaurants is this light-filled brown shingle craftsman nestled on a tree-lined Elmwood street. With a walkscore of 74 & a bike score of 93, leave the car at home to explore all the activities nearby and then head home to relax in the expansive level yard or inviting front porch. This home enjoys charming nooks, fine finishes & generous built-ins. Sunny living room with decorative tile fireplace, bowed window & elegant coved ceiling. Grand dining room with built-in china cabinet & wainscoting, perfect to host an elaborate dinner party or family gathering. An updated kitchen opens to the breakfast room with double French doors to the rear deck. Adjacent family room with recessed lighting and generous windows bringing the outdoors in. 4 bdrms all on 2nd floor. The lower level features laundry facilities, storage & workshop. Close to regional parks, Claremont Hotel & Spa, AC Transit & BART. Seller Agent Comments: Sited to take advantage of sweeping four bridge views is this unique mid-century on the market for only the second time. Built entirely out of old growth redwood and pine juxtaposed with an industrial aesthetic of stainless steel showers, sinks, and countertops, it’s truly one of a kind. Just steps to Tilden Park and the Lawrence Hall of Science and minutes to UC Berkeley and your favorite shops and dining, this home enjoys the convenience to urban amenities yet feels like a vacation retreat. Pass the gated drought tolerant garden, down a flagstone path and open the front door to reach the stunning central gallery that runs nearly the entire length of the home and serves as the nerve center of living and entertaining. The sheer scale of the space, seamless indoor/outdoor flow and breathtaking vistas from a wall of windows can offer a variety of configurations for dining, entertaining, living and play. The open kitchen is bathed in natural light from the skylights above. Seller Agent Comments: A modern townhouse thats beauty is surpassed only by its ecological responsibility. All systems ‚Äì energy, water, heating, fixtures and food – have been selected to allow you to live comfortably on a small footprint. Open concept floor plan with soaring ceilings, natural light, a chef‚Äôs kitchen, and sweeping views of the bay from your private terrace. Conveniently situated between the Gilman Hub and Fourth Street Shopping, with an attached garage and easy freeway access. Seller Agent Comments: Welcome to this 3 bedroom/1 bath Berkeley bungalow. Step inside and be greeted by beautiful hardwood floors, custom Shoji screens and an open living/dining room. The house feels like a small compound, nestled among the hustle and bustle of West Berkeley.¬†Beautiful French doors open to the tranquil backyard, very private and fully fenced in, with some mature landscaping and a gorgeous Magnolia tree. A wide driveway leads to the garage, which can be used as a home office or bonus room as it is insulated, has large windows for light, and is fully wired. If you like to have freshly brewed coffee and bread within minutes of your house, this is it! Acme Bread, Artis Coffee, Whole Foods‚Ä¶ and all of the stores, restaurants and amenities of 4th Street and the Gilman District are nearby. Seller Agent Comments: 5664 Broadway Terrace, has been tastefully updated with attention to functionality & comfort, including gleaming hardwood floors. This well appointed home has 4 spacious bedrooms, making it a home that a family can fit into. Enjoy the 2 master suites, plus 2 bedrooms with a Jack & Jill bath that complete the bedroom level. Another half bath on the main level for guests. This home flows nicely with a spacious living room and formal dining room that‚Äôs imbued with glorious period built ins. The updated kitchen offers balance & seamless movement to the dining room & large, flat backyard, great for entertaining. The flow continues downstair that leads to the family room or the so called ‚Äúspeak easy,‚Äù wet bar! An immaculate home, in a stellar location offers a unique opportunity. Easy access to Rockridge BART, SF Bus & Rockridge & Montclair shops & Restaurants. Seller Agent Comments: Located in highly sought after Upper Rockridge, this 4+ bedroom, 3 bath home is sure to delight with its comfortable elegance and sophisticated style. The impressive entry features a large patio for lounging on summer nights while taking in the gorgeous city view. The interior boasts a limestone entry, hand plastered walls, rich hardwood flooring and inspiring natural light. The entry floor features 3 large bedrooms and 2 full baths including the luxurious master bedroom suite. A built-in wine showcase adds a touch of luxury to a bonus family room that can double as a play space, media room, home gym or office. An elegant wrought iron railing leads upstairs to the main living level as large picture windows frame views of San Francisco and the bay. The living room with fireplace offers a large walk-out balcony on one side and is open to the formal dining room on the other. Location, light and comfortable elegance for all to enjoy. Seller Agent Comments: RARE COMBO: a newer Craftsman home (rebuilt in 2002) and close to all good things on College Avenue and BART!! A spacious house in a quiet Rockridge location with newer systems, windows, roof and foundation! Enjoy your weekends with no home repairs! 4 generous sized bedrooms and 2 baths upstairs and a spacious flowing floor plan on the main level, as well as laundry and half bath. Extended room for visiting family and friends and an au-pair suite with kitchenette downstairs! Private rear patio and sweet backyard! 2 car detached garage! Skylights and windows bring in natural light throughout. Everything you need is all right here! Open Sunday 9/23 2:00-4:30! Seller Agent Comments: Location! Location! You will be delighted with this wonderful Rockridge craftsman with many original details including spacious living room with wood burning fireplace, dining room with box beam ceilings, pocket doors, generous built-ins, and wood paneling throughout. The open staircase with soaring ceilings leads to the upstairs 3 plus bedrooms & 2 baths.The large EIK, half bath & fam area have many convenient storage spots. The rear deck & large private, level enclosed rear garden are perfect for entertaining, gardening, or just enjoying some fresh air. There is a multi-use detached studio & large side driveway parking for multiple cars & the best part -Location!!Location! The home is minutes away from all the exciting and convenient shops & restaurants on College Ave. including Market Hall, Philz Coffee, Wood Tavern,Temesal Farmer‚Äôs, Market,Safeway, Trader Joe‚Äôs & Cole Hardware. Lastly, Rockridge BART,,Casual Carpool, bike share & freeway access are just minutes away. Walk Score 92. Seller Agent Comments: Chic and stylish town home located in the much sought after Hiller Highlands neighborhood. Situated at the top of the hill at the Oakland Berkeley border homeowners enjoy the best of all worlds. The location could not be more ideal one neighbor remarks. From the bustling shops, cafes and restaurants on College Avenue to the Montclair Village and East towards Orinda, Lafayette and Walnut Creek. This elegant town home boasts 3 bedrooms, 2.5 updated bathrooms, an elegant kitchen, hardwood floors plus a lovely garden. Seller Agent Comments: Situated in one of the best Rockridge neighborhoods and on the boarder of Rockridge and Elmwood, 6364 Mystic Street is a hidden treasure, boasting three bedrooms and one full bathroom. Period details are abundant, with its arched windows, intricate trim, built-ins and hardwood floors throughout. Large living and dining rooms. Convenient breakfast nook. Spacious unfinished basement. Secluded backyard. Close proximity to BART, restaurants, schools and local shops. Ready for its next owner to call home! Open Saturday and Sunday from 1-4PM. Seller Agent Comments: 1st Open House Sunday 9.23 1-5pm. Spacious Shingled Traditional Home. Spacious rooms, Fireplace, Hardwood Flrs, & Newly Updated Kitchen. A Real Family Rm opens to a Deck & a Huge Backyard. Wood decking, Usable Gas Fireplace w/seating space to enjoy, & Play space for everyone. Room to shoot Hoops & more. You sitting right a topped 1 of the Rocks in Rockridge. This is Rockridge at it’s Best. Stroll to College Ave shops & Services, Award Winning Chabot Elementary School, BART, Go Bikes, Go-Cars, Go-Scooters, Tech Buses, and Close to U.C. Berk. Seller Agent Comments: This custom-built updated Upper Rockridge Mediterranean four bedroom/three-plus bath home is designed for entertaining. Large formal rooms with high ceilings face San Francisco and the Golden Gate Bridge. To the rear, French doors open to a spacious patio and terraced flowering garden with dining areas and pergolas. The architectural features include Honduran mahogany wood doors and trim with their distinctive beautiful rich reddish brown color. The high ceilings with smooth plaster wall finish have both crown and picture railing moldings. The gourmet kitchen has been re-imagined and now features quartz countertops, a Gaggenau oven, DCS cook top, newer kitchen sinks, faucets, cabinets and cabinet hardware. For entertaining, the formal dining room features San Francisco views. The outdoor dining on the terraced garden sandstone patio is under the stars. Seller Agent Comments: Spectacular 3-bridge panoramic views including San Francisco, the Bay, the Golden Gate, and Mt Tamalpais. Light-filled end unit with 270 degree views. Spacious living room with high vaulted ceilings, fireplace, and deck. Dining area with views. Lovely kitchen with generous cabinet space. Beautiful master suite with high vaulted ceilings & large walk-in closet. Bedroom 2 with vaulted ceiling & deck. Bedroom 3 with patio. Handsome loft and library overlooks the living room. Laundry room with washer & dryer. Large 2-car garage. Seller Agent Comments: Stunning creekside home on quiet cul-de-sac mere steps from Piedmont Ave. Owners rebuilt the foundation, completed seismic retrofit, and remodeled the kitchen and bathrooms while retaining the warm charm of the original craftsman details. Deep inviting front porch with french doors to the dining room and another leading to the spacious entry room make this home divine for entertaining. Creekside in the backyard is a detached bonus space with covered deck for an office or studio. Large, lush yard with fruiting trees and a gated driveway with room for RV or boat. Connect to the Transbay line or BART. Pedestrian alley one door down leads to Piedmont Ave. and its shops, markets, cafes, gyms, cinema, and vibrant food scene to the left; or head right up into Oakland’s treasured Mountain View cemetery and it’s views, community events and abundant running trails and paths. Seller Agent Comments: This vintage Craftsman features abundant sunlight, hardwood floors and 3 generous bedrooms. The living room with fireplace sits adjacent to the dining room with period built-ins. The 7500 square foot lot boasts a large sunny yard full of possibilities. The original eat-in-kitchen and bath provide a wonderful opportunity for someone to create their dream home in a dream location. With a walkscore of 86, a 10 minute stroll to Rockridge BART and only 2 blocks to gourmet shops and restaurants, this home is an urban dwellers dream and great for commuters.